Reston's earliest settlers were clearly giants. We don't mean that figuratively, even though they took a giant leap of faith moving deep into the Virginia countryside to townhouses nowhere near a town, ultimately supporting a new model of suburban living that had worldwide influence. Judging by the giant bandage, eye dropper, and utensils that were on the wall of the former Lakeside Pharmacy at Lake Anne Plaza, they must have been approximately 25 to 30 feet tall. Pictures don't lie, folks! Earlier this year, the iconic decorations were taken off the wall of the former pharmacy, which closed in 2014. The space is in the process of being converted into an exercise spot and some sort of beauty salon, neither of which apparently will offer oversized novelty cutlery and eyedroppers. 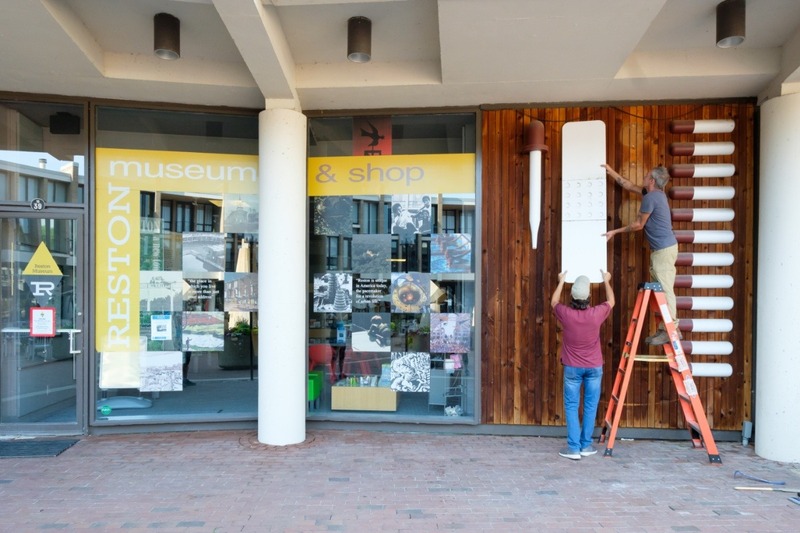 In order to preserve these loved icons, the Lake Anne Reston Condominium Association donated the icons to the Reston Historic Trust & Museum in July 2018. On July 17, 2018, the icons were removed by Capitol Museum Services, known for quality work in custom exhibit fabrication and installation. Capitol Museum Services has placed the icons in storage until they can be reinstalled in a new location on the Plaza. 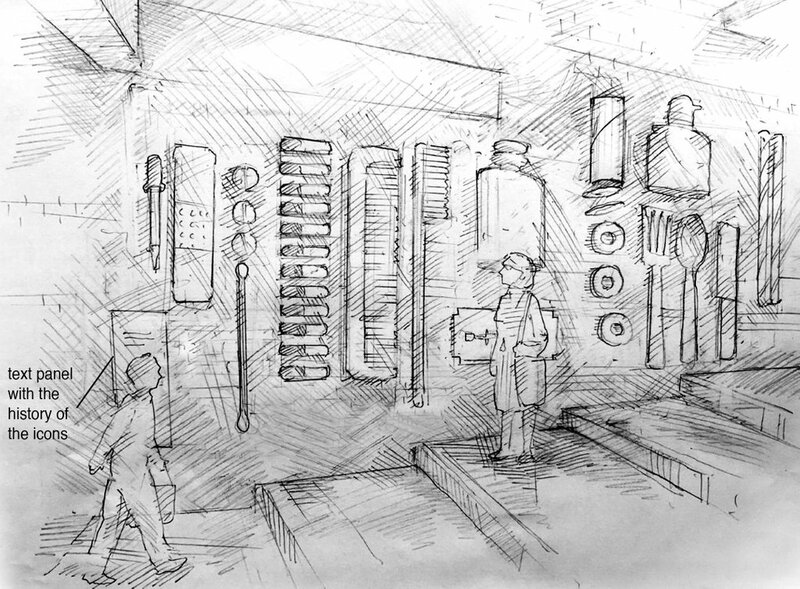 The installation is being designed by Jeanne Krohn who designed the Reston Historic Trust & Museum’s exhibits. We think it is imperative that these icons remain on the plaza at Lake Anne. Last year Lake Anne Village Center was named a national historic district and was placed on the National Register of Historic Places. The icons are an important part of Lake Anne Village Center’s history, representing an original store that conducted business here for nearly 50 years and the public art which was a hallmark of the new community. The New York graphic design firm of Chermayeff and Geismar (now Chermayeff, Geismar & Haviv), was hired by Whittlesey & Conklin, the architects of the plaza, and together they treated the storefronts on the plaza as a form of public art. 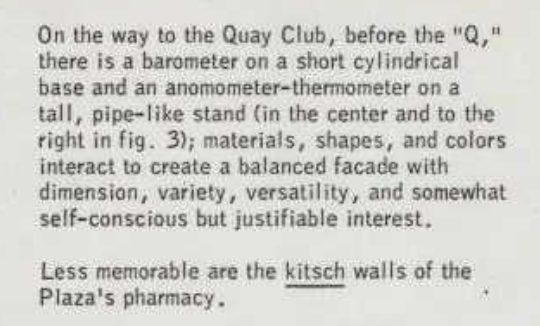 While the main purpose of the Lakeside Pharmacy icons was advertising, the icons are characteristic of the 1960s Pop Art aesthetic and reflected Bob Simon’s wish for fun and whimsical artwork on the plaza. Chermayeff and Geismar were also responsible for creating the logos for NBC and PBS. 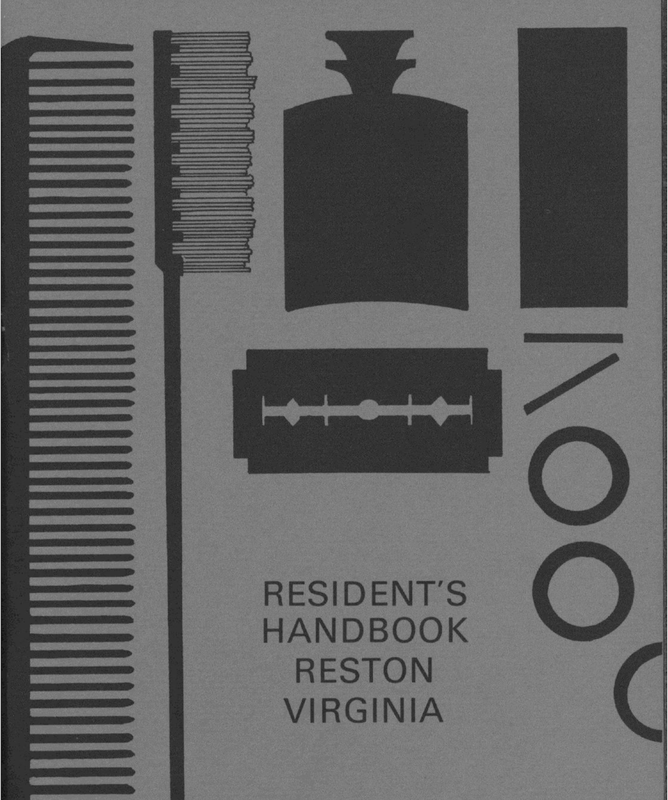 They were such landmarks they were included on the cover of the Official Reston Resident's Handbook, which our plastic fantastic planned community's early settlers presumably had to memorize on pain of excommunication, possibly to (shudder) Herndon. Pretty sick burn for the pre-Twitter era TBH. But by preserving these items in amber forever, we can own the libs brutaletists. Joke's on you, fancypants art types! As of Monday, the Reston Museum has raised $400 of its $15,000 goal, so clicky clicky on the GoFundMe link if you're so inclined. Our future, presumably much taller, Reston residents will thank you, the end.